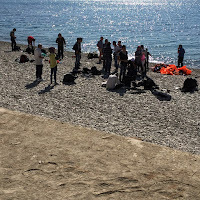 Chios is one of several islands in western Greece nearest to Turkey that represent salvation after migrants' uncertain journey across the sea in smugglers' boats that invariably are overcrowded and unsafe. Chiostown, like Mytilene on Lesbos, becomes their home while they wait for a ferry to take them to Athens and the start of a much longer journey north..
Because Lesbos is closer to Turkey - a bare three miles on a good day - many more of these voluntarily displaced persons (migrants and refugees are often interchangeable in purpose and methods) end up there. Media has made known many of their faces and stories and many if not most migrants are equally familiar with media. ; cell phones are as ubiquitous as ponchos and backpacks - their only real home being what they carry with them in their pockets and on their backs. 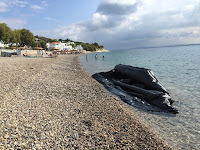 I was in Chios recently, staying in a small secluded settlement with a clean pebble beach that has excellent swimming. This particular area draws locals and tourists alike but not in great numbers since there is no through road, and the island itself is not known as a tourist mecca. On my first morning I and a few others were in the sea, enjoying weightless freedom in clear temperate water when one of the boats was approaching within a hundred yards. To see in the distance a flimsy black rubber dingy topped by indistinct orange blobs - life jackets of devious quality on human forms - is to forever change your sense of what is means to scan the horizon. The group drew near in silence until they felt the crunch of something solid underneath and knew the dingy has made it to shore. Then shouts and cheers went up. They had touched land at last - Europe, their real goal. This group was made up of some 40 adults and children, stepping gingerly out of the vessel, helping one another and then sitting down to rest. 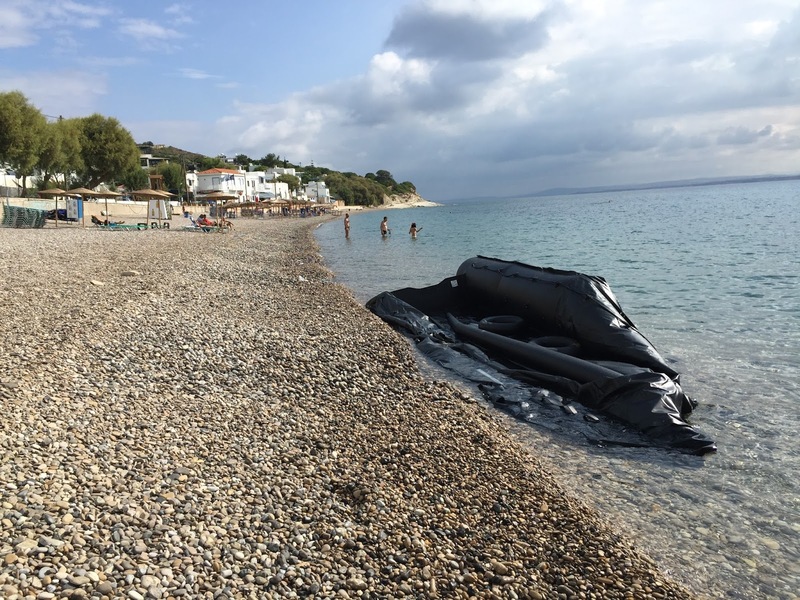 The dingy is immediately disabled, so no one can force them back to sea; it then becomes a crumbled eyesore surrounded by discarded inner tubes and life jackets. It takes a few days but eventually most of the detritus is carried away by locals. The first to go is the small outboard motor; if it still is operational, fisherman from a nearby harbor will grab it. Tourists are citizens with up to date passports welcome in nearly every country; they represent what migrants hope to be and have - stability and personal recognition. This gap, the one between them and 'us,' is huge; awareness of it stings the conscience. There is only so much you feel you can do, you say, except pick up a camera and document the scene. Or is there? My heart goes out to them, and guilt ensues.The same tug at the heart one feels reading remotely about the phenomenon of hundreds of thousands of people from the Middle East and Asia in search of new life. Before leaving Washington I solicited donations from a neighbor for some 'gently worn' me's shoes that he generously provided me in a almost-new backpack that I had in my room barely a hundred yards away up the beach that day. Their own shoes would be soaked, I reasoned; anything dry in the moment might be welcome. I ran to change out of swimwear into 'decent' clothing, grabbed the bag and walked hurriedly to where two young men from the dingy were happily showering - the sort of simple cold water facility used by day swimmers to freshen up. They looked up and smiled, slightly surprised no doubt by a stranger suddenly dropping by barelegged in a flimsy dress. It probably wasn't their first experience being given handouts this way; Turkish people reputedly had been very generous, although Turkish officials were no longer inviting 'foreigners' to stay. The name of one of them was 'Ali' and the only English he knew was 'thank you, ' though we tried to talk more. I asked where they were from, how long was their trip. Aleppo they said - Syria. And they wanted to go to Germany. Of course. "Not America?" I asked.Ali shook his head. A large bus eventually came along , charging each passenger 3 Euros to go some 10 miles into a central plaza in Chios town where the UN Refugee Agency has erected tents - but never enough tents, especially in a storm. The plaza is large and accommodating, attractive even, with room for children to play on grass. There are public washroom facilities - the men set up an informal barbershop outside one of them - and nearby markets have food. Another day I watched another group milling around the port. This was a foul smelling dissolute place by a busy street where lines had been set up - presumably in order to be registered. But, again, the men I spoke with - women kept to themselves, minding children for the most part - were friendly and eager to talk though our exchange was limited. "Journalist?" they said while I proceeded to try to interview a few of them. But again I wasn't able to find anyone able to say much in English. "Why don't you speak Arabic?" asked one, introducing himself as a math teacher. Another asked my age and where I was from. 'America' only elicited another question: "How you like Assad?" On my last day I saw another dinghy that had steered its way to a smaller beach near my lodging. This group had taken refuge around a chapel by the road, as though they knew was this spot where a bus would come for them. They took advantage of some trees and had strung ropes between them to dry wet clothes while waiting. I didn't see any locals around; no one offering help. 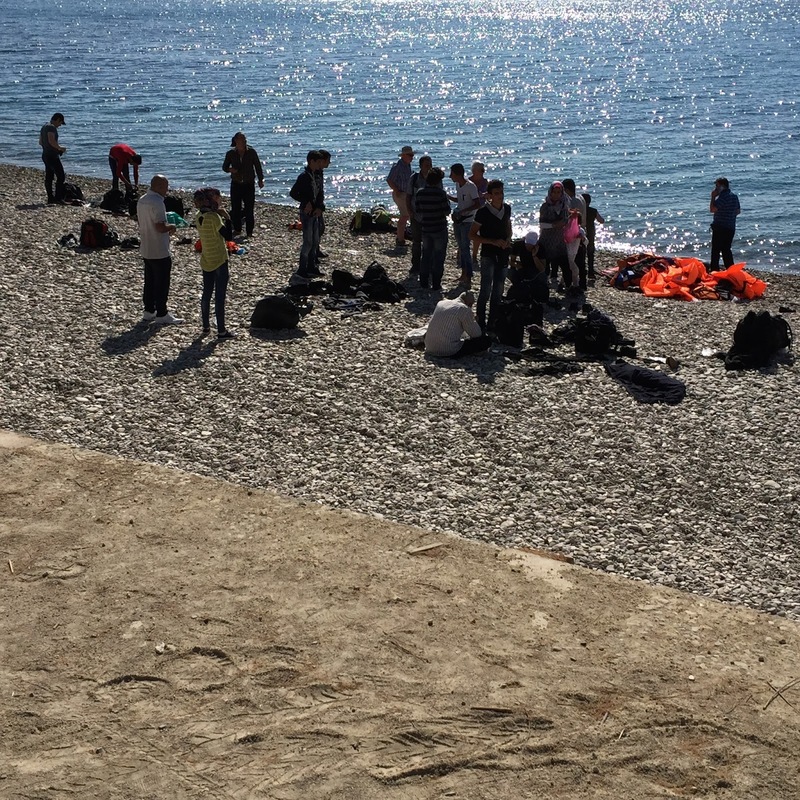 (A cafe owner on the bigger beach below always brought new arrivals bottles of water. ) One man I stopped outside his house said he had already given clothing earlier in the season and didn't appear ready to extend himself any further. I raised my hand in greeting as I walked by, saying "welcome' and ' hello' and 'congratulations' - whatever that might mean to them at this point.The children waved back. Then a tall gaunt man came forward and put out his hands in an imploring gesture. "Shoes," he said. He couldn't have known about my earlier supply, could he? I had no more to give except the flip-flops on my feet. Did he want those? I wondered, feeling helpless and trapped. Trapped by feelings of despair on his behalf, dismay of my own, since what could I do at that moment? All I knew to do was to keep walking, shaking my head in sorrow that I had nothing to give. Awkward, like I said. Awkward to be the observer, a spectator, hiding behind her photo lens, photographing The Other. But not nearly as 'awkward' as creating a new life in an unruly unknown world. The word awkward hardly suffices but what word will do for the complexity of their world to date.